Last edited by gnance; Jun 17th 2018 at 07:16 PM. 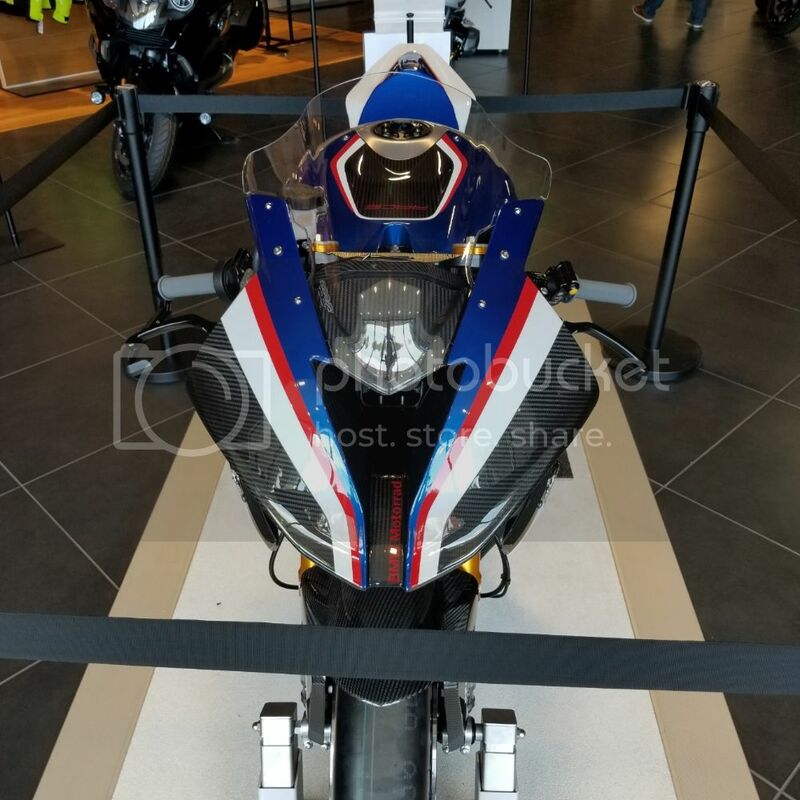 When I was at the MA round at VIR the California Superbike School had one out on display. Absolutely incredible machine. Buy it!!! You know you need it!!! Just take a look at the rear swing arm. It's made by Suter Racing, a company near to my place. I saw how they made them. It's an absolute beauty, NASA alike engineered and flawlessly manufactured! If I had a spare 80k I would! Wonder how much replacing the engine every 3k Miles is as well. Was one at the track a few of weeks ago it was in one of the garages right down the end of pit lane and as I was casually snooping around came across it. A very tasty thing in the flesh and a lot of quality bits attached. It was a sort of Ducati day so a couple of SL's were there as well, as good as the BMW is and technically outstanding the 1299 SL with the race exhaust does yank my chain in looks, sound and Ducati only cool factor. The engine is a very lightly built superstock/endurance spec. Just go buy a stock one on ebay and go through it, nothing really exotic in it. That 3k replacement interval is more along the lines of what to expect were you actually racing for national championships. For everyone else, it will have the same life as a stocker run on the track in all likelihood. If you look in the race kit manuals for all of the major manufactures, it's a similar service schedule to what they advise in those. Many of the items are actually measured in hours and not miles. Not sure why everyone seems to miss that. If I recall correctly, the rebuild schedule for the 1199 for full race use was something like 1500km. Also, Cory Call is racing one in AFM and dynoed 212 out of the crate with no fueling adjustments. I do believe he was using VP gas though, but just poured it in. Definitely pretty stout. Last edited by shakazulu12; Jul 13th 2018 at 03:40 PM.